Yea, I know, the film came out in 1955, making it what? 52 years old? Well here's what I have to say to that...WHO CARES?! I caught an airing of this tonight on AMC and it's encoring right now, actually. I've seen it before but this is the first time I really "got" it. This is one GREAT film! I am convinced it is the most socially relevant film ever made and all of the themes in the film are still relevant, if not more so, today than ever before. The film follows Jim Stark (Dean) as he moves into a new town and tries to fit in. From there tragedy strikes around every corner, leading to an emotional night with his new comrades Plato (Sal Mineo) and Judy (the stunning, Natalie Wood). From a youth ministry point of view, I can't think of a film that I have EVER seen that has challenged me this much. The characters are real and engaging, making you think that these very well COULD be kids you know. One of the quotes that stuck with me throughout the entire film was right before a chicken race when Jim asks Buzz "Why do we do this?" and Buzz replies "Hey, we gotta do something, right?" That's the attitude still taken by today's youth with whatever they may be involved in, they're doing it to avoid boredom, and they'll do whatever it takes. Especially at jr. high-high school students. 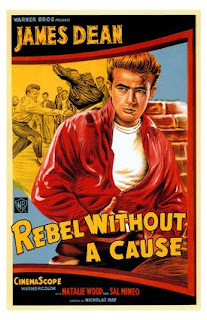 If you are involved in youth ministry in any way, shape, or form check out Rebel Without A Cause.